Oh yes! … This chimes in so well with my thoughts. I’ve used mind maps and concept maps for well over 30 years and wouldn’t be without them. If my thoughts are wavering, or I’m just starting a project, or learning a new topic, I find them an invaluable technique for getting my thoughts in order, but rarely have I got value out of someone else’s. For me, the principal value in mind and concept mapping is the process. YMMV! For beginners, looking at maps that more experienced users have made can help them on the path to making their own maps. But I find the layer of abstraction too great and the detail too little. I make the comparison with trying to understand what a human body is while looking at a wired-up pathology lab skeleton. @karimbrohi says he routinely uses mindmaps but it’s the act of creation that leads to understanding. He says he finds mindmaps of others hard to interpret and is not sure they’re best way to present collated information. There are many mind map libraries (click the image to see a consolidated list at mind-mapping.org) and for some, particularly new users, these may be useful, but the process, the act of making, is where most of the value is for me. This is an important topic, so chip in with your ideas – please! 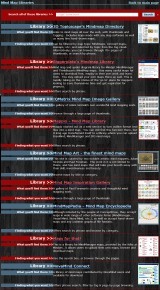 When the discussion is over, I’l consolidate it into an article on the mind mapping wiki.